‘Advanced’ wound healing therapies reactive healing processes in chronic wounds. The positive influence of biophysical treatment modalities (light, mechanical, or electrical stimulation) on wound healing processes are observed, while the underlying biological mechanisms of action are fundamentally established and continue to be investigated. Currently, there are no standard protocols for these emerging therapeutic technologies, likely due to unverified or incomplete treatment parameter reporting. Notably, what has not been investigated is the effect of biophysical treatment modalities in combination and their interaction. Together with industry partners, we aim to develop a multimodal automated wound healing therapy treatment device developed from engineering design approaches to provide patient-specific, data-driven therapy for chronic wound patients. 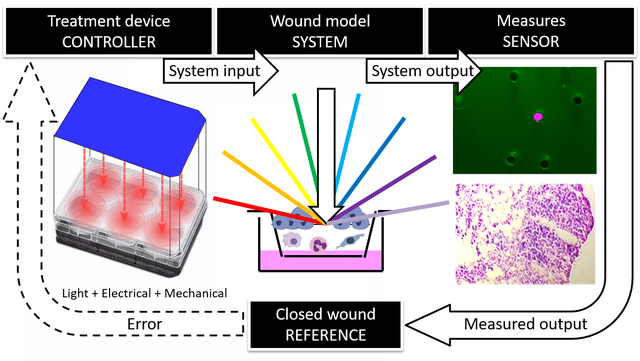 We support this work with treatment experiments and mathematical modelling of the wound healing system.